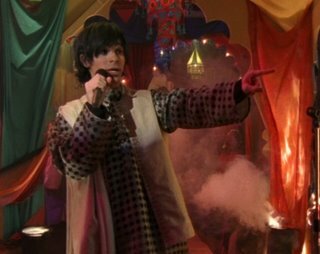 In his words, "It's themed on those movie musicals from India, so hot right now!" It's even consistent with his character; earlier on this DVD he goes to see Pather Panchali. Do you think he might also be the aforementioned gay character, and that the girl in the poster with him is the long-suffering beard? Well done! To be fair, said girl is over him this season and dates...well, Lite Maple Syrup Eminem, basically, but they seem to really like each other, so who am I to judge? 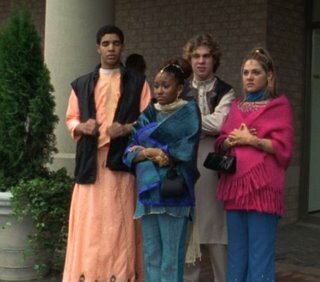 This being Degrassi, nothing goes quite as planned, and the spanner in the works is a fire in the gym (which Melina, who hooked me on this, says in an homage to an episode from the original series - I love a good in-joke, even if I don't get it). One of the things I like about this is that whoever designed the set did a good job making it look raelistically like a high school gym attempting a theme that no one except the committee chair really understands. 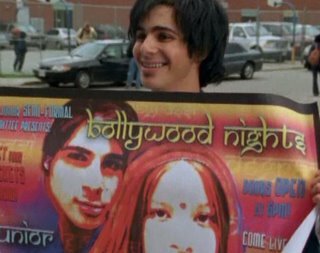 Mysteriously there are no South Asians in the Degrassi Community School; having spent two years in Toronto, I can tell you the odds of this are slim, but whatever, eh? It looks like the kids bought a few things from the shops in the Indian neighborhood, draped some fabric, and used that fun Samarkan font as much as they could. I can imagine them on the streetcar, rummaging through Kensington Market and and the garment district, giggling and bumping into things with their overflowing backpacks. During my years in Toronto I lived in an Oxford-style residence college for graduate students, and we had a social committee and themed parties all the time (including a Christmas gaudy and a postmodern party), and that's about what we would have done. (We also would have added in some snooty-patooty references to trivia or famous scenes or directors or something, since we were in an elitist graduate college, but still. One teeny quibble. The fellow on the left here was responsible for ordering outfits for the big night, and there was a snafu. He says he ordered two kurtas and two saris but got one kurta and three saris, one of which he then has to put on. How many saris do you see in this picture? Shoddy work, guys. That's easy to look up. Still, I loved it. It was great. And I would gladly trade it for either of my prom themes - "Wonderful Tonight" and, even though it was 1992, "Open Arms." Gasp..."Open Arms"? Oh-no, my life-long-Barbie-playing-companion, I would trade "Open Arms" for nothing (other than "Faithfully", natch). Thanks for getting hooked on DTNG with me! Ohhh...i love degrassi - but i love the old ones! I love looking at all the clothes they wear and what issues were important back at that time - it's actually one of my favourite shows, but i'm not too big on the new series. Haha, i wish we had a bollywood themed dance - that would have been awesome!